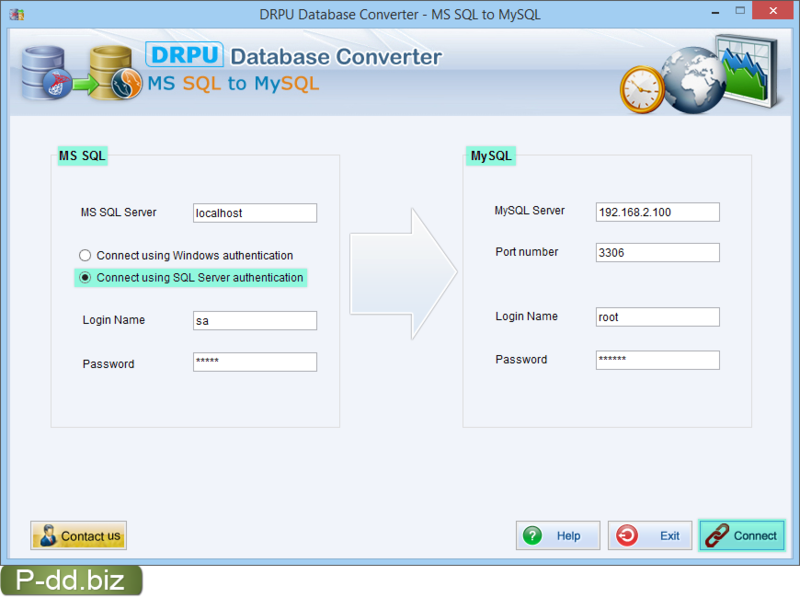 DRPU database converter software convert selected or entire database connect server locally or remotely. Software supports all version of MS SQL and MySQL database server. Database conversion tool provides facility to convert all data types, indexes, views, queries etc and also allows you to skip converting indexes. Data Doctor’s database migration utility allows users to overwrite MS SQL database records into existing MySQL database or saves the converted database records at user’s specified location provided with user friendly GUI interface. Connect MS SQL and MySQL using SQL server authentication method. Easily converts MS SQL database created records into MySQL database server. Database conversion utility supports all major MSSQL data types, attributes, indexes, key constraints etc. Accurately converts MSSQL database records without loss of any additional information thus maintaining the database integrity. Provide option to save converted database records at user specified location for future reference. Support all latest version of MSSQL database server. Highly interactive graphical user interface is provided for the ease of user assist. No technical knowledge or skills are required to operate the database conversion software.